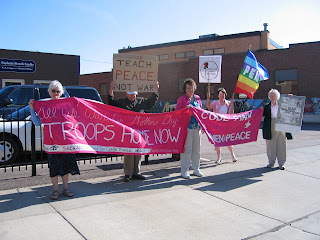 About a dozen passionate, concerned peace activists participated in a protest in front of their Congresswoman's office this morning. 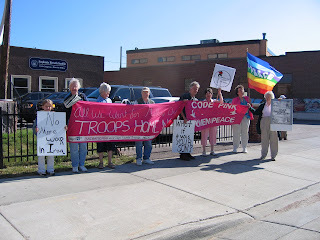 Several activists drove over an hour to be here and most came after less than 12 hour notice! Congresswoman Stephanie Herseth Sandlin recently voted to grant Bush $100 billion U.S. taxpayer dollars to escalate the occupation of Iraq and she also voted against a timeline for withdrawal of U.S. troops from Iraq. Activists were especially distraught because the Congresswoman had originally voted for the timeline and then, the second time round, changed her vote capitulating to Bush’s threatened veto. A staff member explained the change: Stephanie was willing to begin bringing troops home in 6 months, after an additional 600 or so U.S. soldiers have been killed and an additional $100 billion U.S. taxpayer dollars spent, but unwilling to begin bringing troops home in 3 months, after 300 killed soldiers and $50 billion more dollars spent. The Congresswoman was not available to meet with her constituents and neither was the district manager, but a constituent staffer was cordial and met for almost an hour, hearing the oft expressed bitter disappointment from the Democrats in attendance, took copious notes about what her constituents are expecting from her, and agreed to request an appointment to speak with the Congresswoman herself. Constituents also suggested that the Congresswoman hold a Town Hall Meeting on Iraq and invite the rest of her constituency to attend. Many have hopes that this will take place within a month. Prior to meeting with staff, the protestors bannered in front of her office to a plethora of horn honks, waves, and peace signs from the sparse traffic that passed. 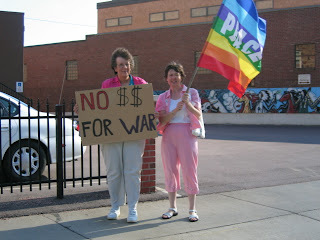 One protestor from CodePINK, Pax Christi, and United for Peace & Justice, commented on the overwhelming positive response from passersby, and pointed out that not one person passed giving the finger or expressing any disapproval! Activists are planning further protests at Congresswoman Herseth Sandlin’s offices in Rapid City and Aberdeen over the weekend.